Yarn: Malabrigo chunky, 1.5 skeins in dusty pink; Lorna’s Laces bulky, .25 skein in natural. Mods: The jumper pattern called for much bulkier yarn and size 17 US needles. I cast on the number of stitches for size 3 to make up for the change in gauge. I also repeated the 3-row garter pattern at the top of the skirt decreases. Lastly, I secured two perfectly matched buttons to the straps. No major story here. 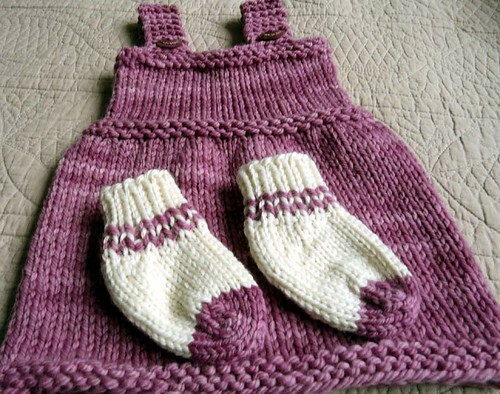 The baby jumper knit up in a matter of 2 or 3 days, as did the little socks. Except, well, I did make three of them. You see, my gauge was way off on attempt number one because I used size 10.5 US needles and the sock ended up 25% bigger than it ought. It has taken on a second life as a catnip toy, hence the 3 days: make one, oops; rest a day, then make two. In truth, these items were finished and delivered nearly one week ago. I’ve been slow to the blog because of hurried attempts to make a hat from the leftovers, which were plentiful. Although I finished the hat (much to the chagrin of my right arm and left wrist), I ended up pulling out the neat grafting and frogging the top off. I simply couldn’t reconcile myself to the shape. It put me in the mind of a tea cozy. The problem? I did not decrease soon enough. Once my limbs recover, the fix will be in. Again. Believe it or not, I started my decreases too soon the first time around. Sheesh! Karen, that set really turned out beautifully! I hope everything’s OK and that 2009 is treating you well! So adorable! I love that the outfit is not a pastel. First, let me say that I’m a huge fan of your posts. You’re on my List Of Ravelry Favorites, and I often share your stuff with my knitting friends. 3) What does Ravelry give you that other sites don’t? 4) Absolutely anything else you’d like to share with me on this subject. Very pretty, Karen! I love the colors. That is one lucky little girl. Oh, gosh, these are both so wonderful! What a great gift. how lovely and so baby feminine! Yeah, Itook a day of rest for my hands today, too. Grimp, grump, grump. Hey, nice blog. Good writing as well as knitting. That is one very cute baby ensemble. Excellent color! Both are adorable, but those socks just totally make the outfit. A very lucky little girl will receive this lovely handiwork! How beautiful – I just love the socks! gorgeous! i love the colour. like a muted eggplant. What a lovely baby set! Nicely done, friend. What a nice set of baby clothes, totally my color!